On her first day back at the job Detective Rebecca Everhart has a new female partner to cope with as well as this baffling case. Rebecca has just come back from a traumatic homicide case that left her shaken and can the two women work together? Then another body turns up with the same gruesome wounds as the first. Has Rebecca got a serial killer on her hands or a mob war? And will she continue pursuing the murderer of her ex-partner’s brother, despite warnings to stop? She must enter the tightly-knit Portuguese community to break the case. Time is running out to stop the vicious killer. If there’s one thing this Ginger Book Geek likes, it is discovering new authors. E. R. Fallon is certainly a new author to me. 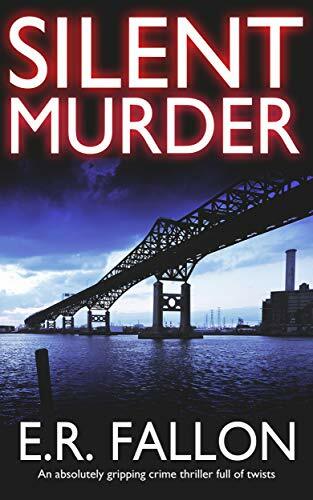 ‘Silent Murder’ is the second in the series featuring Detective Rebecca Everhart. The first book in the series called ‘Body In The Box’ was released in 2016. I absolutely and thoroughly enjoyed reading ‘Silent Murder’ but more about that in a bit. I took to Detective Rebecca Everhart from the first moment that I came across her. The beginning of the story sees Everhart returning to work after having a period of leave following a traumatic case involving children. She is a bit apprehensive about returning to work but then that’s normal for anybody after a period of time off work. It’s all change as regards who she is going to be working with and there’s a staff shortage. Everhart accepts this and she promises to do the best that she can under the circumstances. Everhart is kind, compassionate, patient, thorough and sensitive. The fact that she shows her emotions makes her even more likeable in my opinion. Everhart is kind of dumped in the deep end as regards this case but she sees it as a challenge, which she is going to complete and she will be keeping a promise that she made to her friend. That’s all I am going to say on front as I would hate to give too much away. Does Everhart keep her promise and solve the case? Well for the answers to those questions and more you are just going to have to read the book for yourselves to find out as I am not going to tell you. For me, ‘Silent Murder’ is really well written. The way in which the author has written the story reminds me of the way that Sue Grafton used to write her Kinsey Milhone series. The text reads as if it is Everhart herself is narrating the story, which makes the story all the more realistic. I really like and enjoy this way of telling the story. The author’s writing style is such that she entices you in and keeps you under her ‘spell’ until the moment you get to the end of the book. That’s what happened to me at any rate. The story definitely starts with a bang and maintains the pace throughout. I certainly won’t forget the descriptions of the deceased victims in a hurry but it would be a good idea not to read the book whilst you are eating as the descriptions may put you off your food. Oh my word, I soon became addicted to reading ‘Silent Murder’ and I found it very hard to be parted from the book. My Kindle wasn’t exactly glued to my hand but it might as well have been because it came everywhere with me. I was so addicted to the author’s writing style and the storylines that I couldn’t stop reading. The more of the book that I read, the more I wanted to read and the quicker the pages seemed to be turning. I was interested to see which direction the investigation would take and whether or not my suspicions were correct, which they weren’t. I thought I knew who was doing the killing and dismembering and why, only to realise that it was somebody else entirely. ‘Silent Murder’ certainly kept me guessing and kept me on the edge of my seat. In short, ‘Silent Murder’ was an entertaining read and I thoroughly enjoyed it. I would definitely recommend this book and this author to other readers. I can’t wait to read what comes next from E. R. Fallon but whilst I wait, I will be reading ‘Body In The Box’ as soon as I can. The score on the Ginger Book Geek board is a very well deserved 5* out of 5*.